Hey there, I am taking a little hiatus from this blog until September. I am busy fermenting at Kraut Source. Please visit me there. You know that a loaf of bread is good when it has cocoa powder, molasses, and caraway seeds. What makes it even better is that it is gluten free! While traditional German-style pumperknickel is very dense and resemble more a brick than a loaf, this recipe is in the North America-style, which tends to be much lighter in texture and also contains all those yummy ingredients just mentioned. It is absolutely divine just out of the oven! Place dry yeast in a small bowl with warm water and Sucanat. Allow yeast to activate for about 10 minutes. Place wet ingredients in a large bowl and mix well. In a medium bowl, mix all the dry ingredients together. Now combine dry ingredients into the wet, and add in the activated yeast mixture. Stir the whole thing with a wooden spoon for about 3 - 4 minutes. Shape the dough into a loaf and place it onto the prepared baking sheet. Cover loaf with another piece of parchment paper and put in a warm place to proof for an hour. After dough has proofed, pre-heat oven to 375F. Lightly brush top of loaf with the egg yolk and sprinkle on some coarse sea salt. Bread is ready when the internal temperature reaches 185F. Keep leftover bread in the fridge and toast before serving. This recipe was developed by my good friend and colleague, Lizette Marx, a nutritionist and chef and c0-founder of an organic, and gluten free catering service, Kitchen Treasures. And co-author of Flavors of Health Cookbook . I grew up scooping white mayo from a jar and thought for the first few formative years of my life and this white substance was real mayonnaise, but oh, how wrong! If you think that “real” mayonnaise comes form a jar by way of the supermarket, then you’ve been missing out on one of the most luscious taste sensations around. Real is real, and in the case of real mayonnaise, the only way to really experience it is when it is made from scratch, with eggs from pastured hens. Unreal mayonnaise, and I’m referring to the insipid white stuff from the grocery store, labels itself as “real” but is often made with genetically modified soy or canola oil, along with additives such as calcium disodium EDTA, otherwise known as ethylenediaminetetraacetic acid (any ingredient that requires you to catch your breath three times before you can say it should not be ingested). Store-bought mayo also contains eggs from factory farms, where hens are kept in crowded, unsanitary conditions causing them undue suffering. Because of extreme over crowding and stress, battery hens are prone to bacterial infections, and are shot up with antibiotics and hormones. The eggs that they lay contain residues which will negatively affect your own hormonal balance when eaten. What’s more, conventional eggs cannot compare with the taste and nutritional value of 100% free range (pastured) eggs. Place your real mayo in a class jar and store in fridge. Consume within 7 days. Place the yolks, lemon juice, and Dijon mustard in a blender. With the motor running on low, slowing pour in the olive oil in a slow stream until it thickens like, well... mayonnaise. Add in seasoning, pulse a few times to mix, and adjust with more salt and pepper as needed. Other spices/herbs you can add in are cayenne pepper, curry blend, dill, parsley, or thyme. Why is Store-Bought Mayo White? I must confess. It took me a while to really appreciate the flavors of lacto-fermented foods. The only thing that I did like eating was yogurt, but when it came to fermented vegetables, well, I just didn’t see what all the fuss as about. I usually tossed out the pickles that came with a sandwich, and asked the hot dog vender to go easy on the sauerkraut. But then, something happened when I tried my first batch of live-culture sauerkraut! It dawned on me that all my previous encounters with sauerkraut and pickles were not “alive”. Because most commercially made preserved vegetables are done with vinegar and also pasteurized, there were no active healthful lactobacilli organisms to thrill my taste buds and make my tummy happy. Now, almost 15 years since my first batch of sauerkraut, I am a devotee of lacto-fermented foods, and can’t imagine a meal without a little mound of sauerkraut or other tangy fermented vegetables on the side to perk things up. I even have it with my scrambled eggs in the morning. Choline: Sauerkraut contains choline which is an amino acid needed for good liver health and the production of acetylcholine. This is a neurotransmitter that helps with memory and is protective against Alzheimer’s. Vitamin C: Fermented vegetables contain large amounts of vitamin C. This common, and over looked vitamin is one of the most critical nutrients for the immune system, vision health, and to buffer stress. Minerals: Lacto-fermentation increases the bio-availability of minerals present in food, such as manganese, calcium, and potassium. Bacteriocins: Lactobacilli competes with harmful bacteria such as shigella, salmonella, and e.coli. Therefore eating fermented vegetables on a regular basis protects against these pathogens. Vitamins K & B: The presence of lactobacilli organisms in the gut actually creates vitamins K and some B.
Detoxifies: Fermented foods provide the most bio-available form of beneficial bacteria, and these probiotics are some of the best chelators available, capable of pulling toxins and heavy metals from the body. Improves digestion: As people age, the production of hydrochloric acid is reduced, which means that the stomach is less able to properly digest food. Lacto-fermented foods help increase the action of hydrochloric acid, while also protecting the integrity of the stomach lining. Prevents cancer:Lacto-fermented sauerkraut and other cruciferous vegetables are rich in indole-3-carbino, a well-known cancer fighter that helps to remove excess estrogen. Dietary Fiber: A delicious and nutritious way to increase fiber on a daily basis. The vegetables must stay submerged beneath the brine (salt + water solution), as anything that stick up above the brine will start to mold. As the vegetables ferment, cardon dioxide is produced, and this needs to be released, while new air needs to be kept out, because the lactobacilli strains require an anaerobic environment to grow. Ideal temperature is between 72 – 75°F. Admittedly making your own sauerkraut or other fermented vegetables may seem intimidating or just plain too much work. Traditional crocks require a lot of chopping of vegetables to fill them, and it you are using a mason jar, it’s a challenge to figure out a way to keep the vegetables safely submerged underneath the brine. However, there is a new system using wide-mouth Mason jars that simplifies everything! 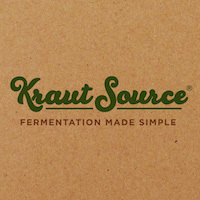 Curious about Kraut Source? Please check it out on Kickstarter. Cox, Jeff. The Essential Book of Fermentation: Great Taste and Good Health with Probiotic Foods New York: Penguin Group, 2013. Campbell-McBride, Natasha.Gut and Psychology Syndrome: Natural Treatment for Autism, Dyspraxia, A.D.D., Dyslexia, A.D.H.D., Depression, Schizophrenia York: Maple Press, 2012. Chocolate, chestnuts, cake, and paleo! That’s right, have your cake and eat it too is what I say. At the end of May, 2014 California’s Senate Bill 1381 was rejected by just two votes. Had the bill passed, it would mean that foods containing GMO ingredients would need to be labelled.